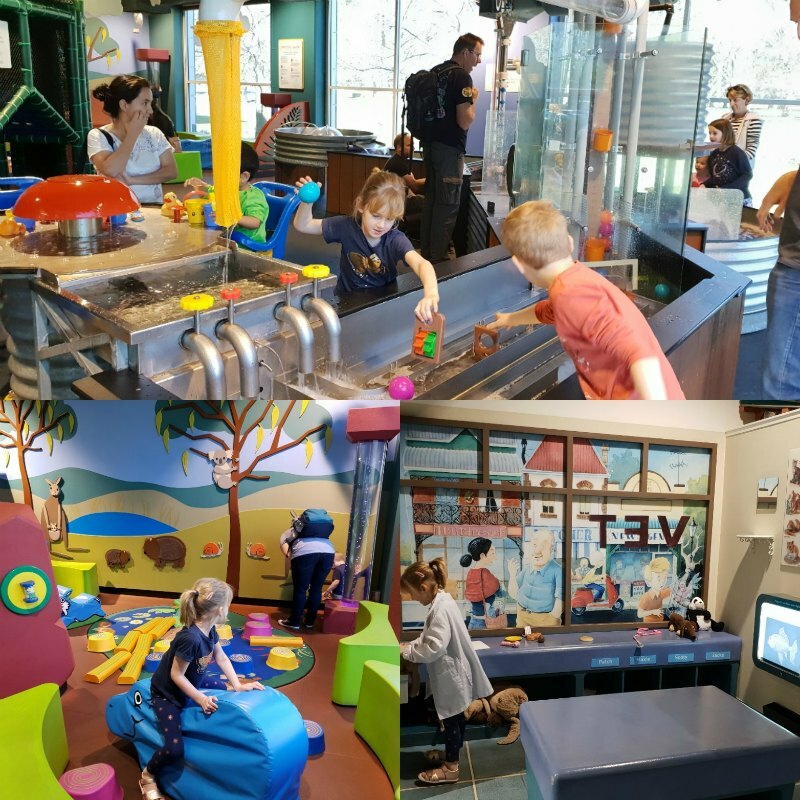 If you’ve been to Canberra, or even if you haven’t, you’ve probably heard of Questacon, the amazing National Science and Technology Centre. It’s been around for 30 years now and if you’re visiting the nation’s capital, with kids or without, we think it’s well worth a visit! 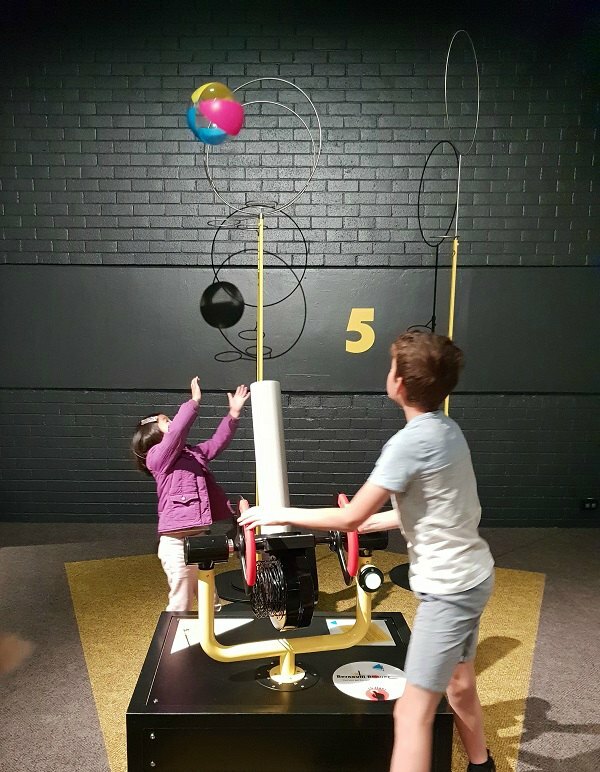 How long you visit Questacon for largely depends on the ages of your kids and how long you’re spending in Canberra. We think it’s best for kids of about 4 and up. We spent 3.5 hours there recently but could have stayed longer – that was with a 4.5 and 6.5 year old. 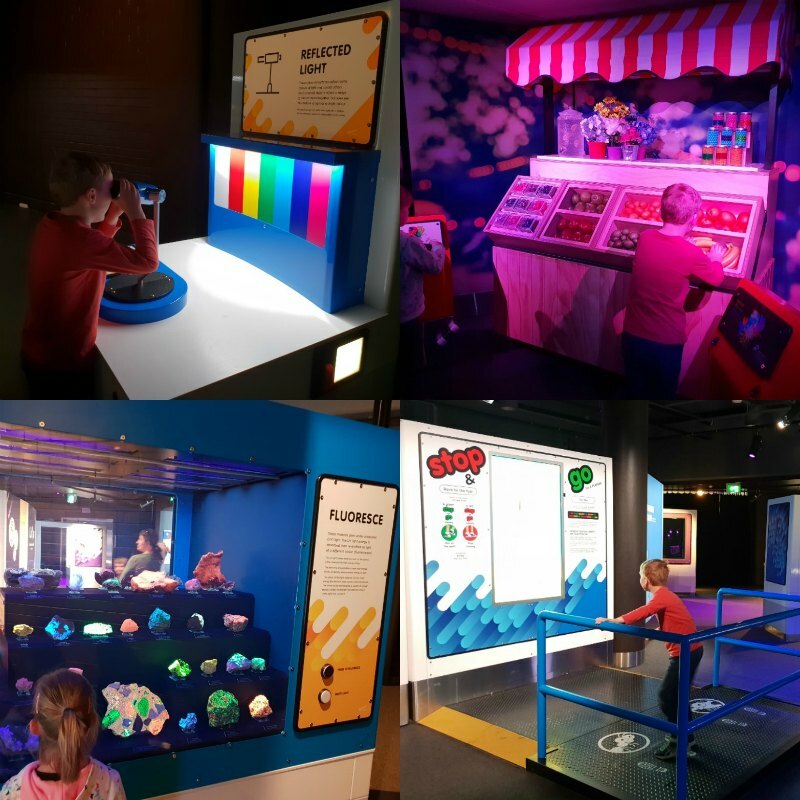 If you’re in Canberra for a short time there may be other things you’re wanting to see which may also restrict the amount of time you’re able to spend at Questacon. What we really loved about it is that the whole family enjoyed it, parents included! So, if you have the time, you could easily spend a few hours at Questacon. If you have older kids, they’ll also think it’s great and you could even let them wander around on their own. The space is really easy to navigate and is divided into 8 galleries, each with a different theme and focus. This keeps it interesting, and if you do have limited time, it means you can choose to visit those that interest you. There are also live shows, so find out what’s on that day and make a note of the time. We really enjoyed the show and it gave everyone a chance to sit down for a rest for about 20 minutes. Here’s what you’ll come across as you explore Questacon. There are 25 interactive experiences in this first gallery, ranging from coloured bubbles to iridescent insects to colour illusions. Explore how light influences colour, and compare your perception of colour with your family and friends. This was really interesting and proved that hubby is definitely partially colour blind as suspected! This exhibition shows the power colour has on the choices we make every day, and on our responses to our environment. You can answer the questions… Is your yellow the same as mine? How do pixels and paint differ? Have you ever wanted to see UV light like an insect? Also really interesting were the stories from people who see colour when they hear music. In this next gallery you can explore simple scientific principles and phenomena. 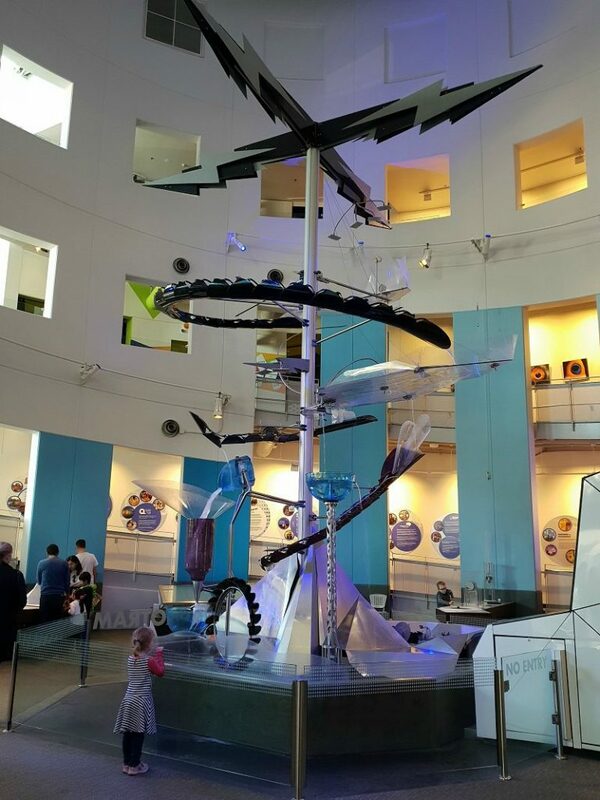 Explore forces, light and momentum in cool exhibits like Harmonograph and Frozen Shadows. This gallery is all about the awesomeness of our planet. You can explore the phenomena that drive Earth through heat, gravity and momentum. 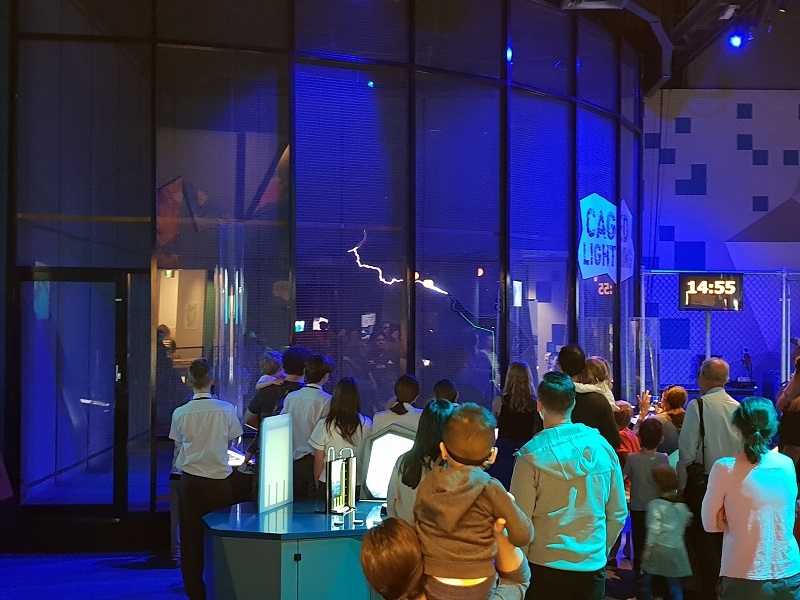 The two highlights were definitely the caged lightning and simulated earthquakes! Very cool. Is this gallery you can watch live demonstrations and experiments. We watched a cool yet simple experiment involving a plastic bottle, a pump and polystyrene balls – and the outcome wasn’t what we expected! 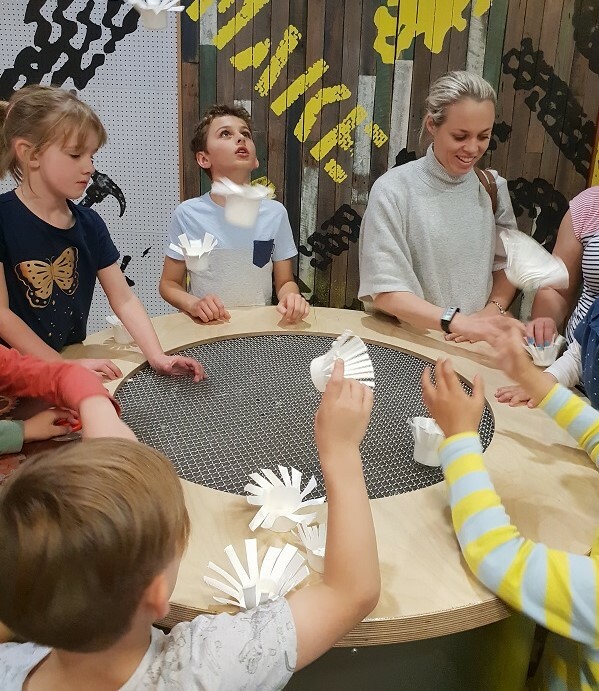 The Shed is a creative place within Questacon dedicated to experimentation with ideas, tools, science, technologies and art. The space includes hands-on exhibits, artworks from artists and makers, and a tinkering studio where visitors can design and make. This simple wind machine was heaps of fun! This is the space for little people up to age 6 and involves lots of imaginative play and water! 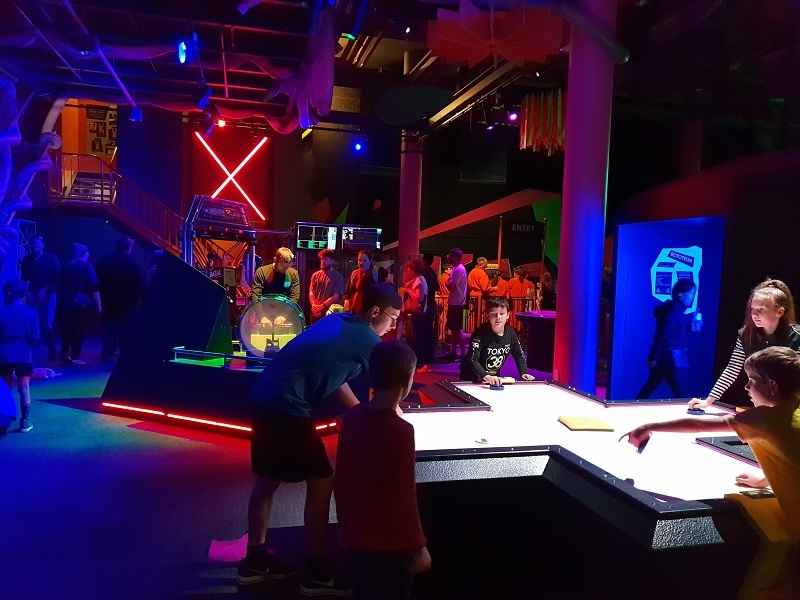 This space is very cool, with lots of interactive, high paced activities – the kids loved the air hockey and the handkerchief chute (for want of a better description), dad loved testing his pace in the cricket-style nets and also the reflex tester game! There’s also a six metre free fall slide. The final gallery is all about water and how it shapes our lives and landscapes. 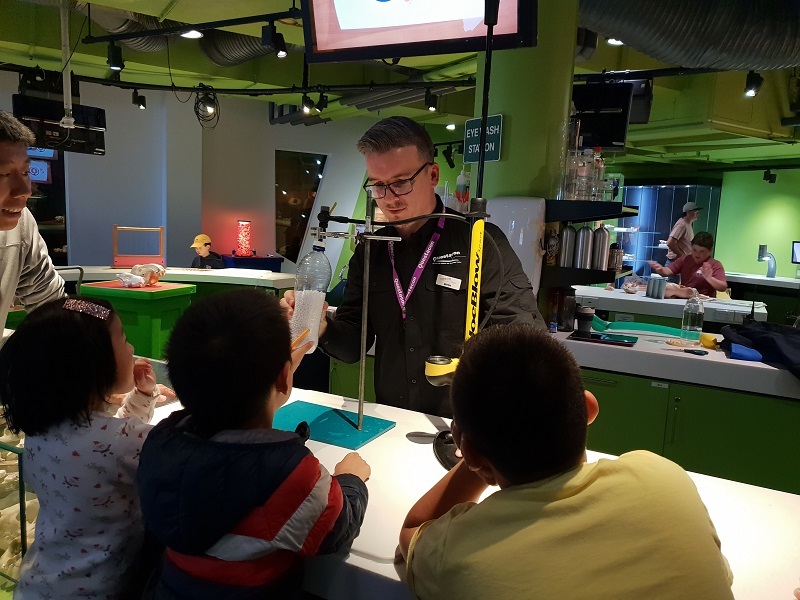 Get hands on and boil water, launch a hydrogen rocket, pump water towards the ceiling and reveal how much water is used to manufacture food and clothing. And since our visit, two new galleries have opened – The Moon and ‘Born or Built?’ which examines the similarities and differences between humans and machines. Sounds like the perfect excuse to plan another visit! There are baby change facilities and toilets. There is a cafe on site and water fountains. There are lockers if you want to store items – these are $2 each. The shop is very cool and is worth a visit!